Maybe she felt like she hadn’t done a whole lot with her life yet, so she decided to go for a new twist to life…. That makes sense–she probably saw her sisters’ lives going in lots of different directions that may have seemed more interesting than her life up to that point in time. “Aunt Marian was in her 40s—and had lived her entire life in rural central Pennsylvania. She lived with her parents and helped on the farm until her father died in 1943”–I think this might say it all! Where else could she have had this sort of adventure and new experiences, without a lot of money and with the safety net of the American government? How true–most of the other options that may have been open to her seem pretty mundane (and maybe even bleak) compared to the path she took. I laughed and laughed at your comment that “good grief, she was in her forties.” When I quit my salaried position in order to begin my own business, I was 44. That was (ahem — you do the math) 24 years ago. As the old saying has it, the best was yet to come! You’re absolutely right! The best parts are still to come. Your comment was a good reminder that I also made some major changes in my career direction in my 40s. I hadn’t really thought about the changes in Aunt Marian’s life within the context of my own–but I now realize that I should have. Maybe she wanted to get away from all that family AND farm work??? What an exciting thing to think about!!! She seems to have been a real care-giver at heart. Caring for her dad and then caring for the sons of America – seems a good fit to me Sheryl. 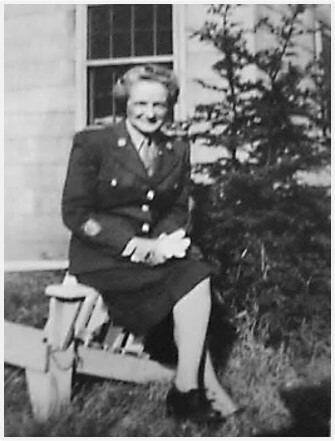 I like how you framed Aunt Marian’s life.I have tended to see discontinuity between the two segments of her life–but really there may have been a lot of continuity as she shifted from caring for her father to helping others in the military. At first I wondered about her decision at age 45, but in light of the other circumstances, it does make sense. My husbands aunts were very patriotic-minded and wanted to do whatever they could to support their servicemen. From everything I’ve read, it seems like most people were very patriotic during WWII and did whatever they could to support the war effort. Yes, a change of scenery and a chance for adventure. I always find it interesting how some people talk about wanting an adventure–but never get beyond talking about it; while others actually are very adventuresome and make major changes. Count me in on the idea that she wanted to escape. Farm life is hard. I agree, farm life can be hard. My general sense is that it wasn’t really an option for her to stay on the farm after her father died–and that it was sold during the estate settlement process. I’ve found in life that some of our best decisions are made for us. They require us to step outside our comfort zone and discover something we didn’t know we had in us. Sounds like that might be the case for your aunt. I cannot imagine on embarking on such a journey at the age of 40. She must have had a plan. Loved that poster! 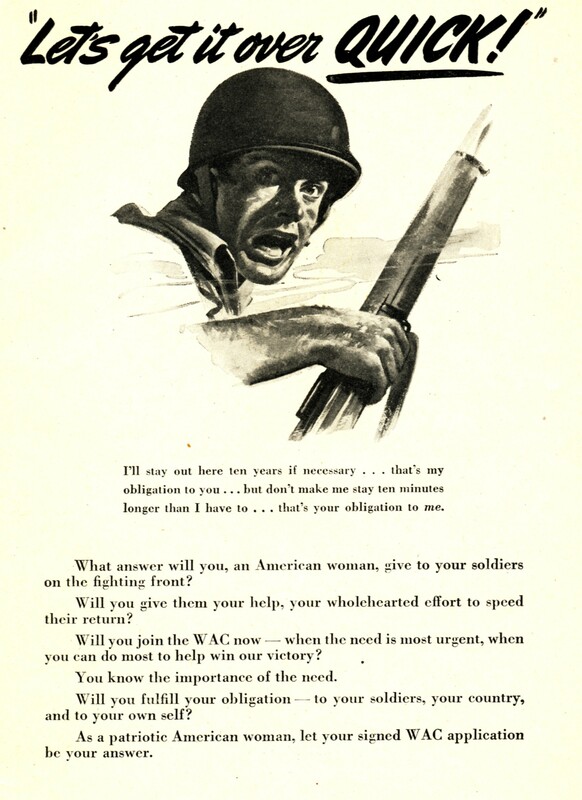 Some people talk about having a “middle age crisis” when they are in their 40s that sends them heading into totally new directions–maybe Aunt Marian had similar feelings that led her develop a plan to join the WACs. This was the first thought that crossed my mind…or that Peggy Lee song, “Is that all there is?” as she looked at her life so far. She sounds like a remarkable woman who did what needed done yet still setting goals. Good for her! I can see the appeal that an ad like this would have had for her. Suddenly she had some new found freedom and wanted to do something exciting- what an interesting woman! Families can sometimes hurt each other feelings when it comes time to break up their parent’s home. They will argue over stupid stuff and fight over who should get what. It probably was hard to have to give up the home she worked hard to maintain. I suspect she took a chance on this in order to support herself and for the independence from the family that she had been tied to for so long. Women didn’t earn enough for the most part to live independently in small rural towns. She could save her money and learn a skill that she could use later. So who wants to be an old maid aunt helping all her relatives raise their kids and clean their houses. She stayed because she liked it better then going back to Pa and they had a place for her in the service. She simply made a career out of it as long as she could. This scenario makes a lot of sense to me. I feel really proud of her that she was a strong enough person to take a chance and join the WACs.